In January 2009, LaHood was nominated by the Obama administration for the position of Secretary in the Department of Transportation and confirmed in January 2009. Rashida Tlaib For Congress November 14, 2013. Dear Friends, I know that many demands are placed on your time and money—and sometimes from me. While this is yet another request, this one is different. For those of you who know Rashida, you know why. For those of you who have not yet met her, trust me, you will understand after meeting her on Monday. Rashida Tlaib is an extraordinary person. A community organizer whose public service led her to the Michigan House of Representatives, she is now running for the state senate. Talk of a congressional seat has already started. 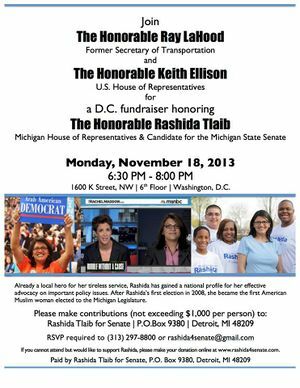 Next Monday, November 18, from 6:30 to 8:00 PM, Secretary Ray LaHood and Congressman Keith Ellison will join us to support Rashida at a fundraiser for her state senate campaign. Please write a check and give us one evening to support someone who is already a star on the Arab American “Farm Team” of officeholders. And if you are not in DC, here is the link to make an online contribution (www.rashida4senate.com). She has inspired so many of us with her unsurpassed energy, her commitment and her extraordinary courage. Please support her. Maya — with Muzammil Ahmed and Shahid Tahir. As of January 2018 Raymond LaHood served on the Board of the Arab American Institute.